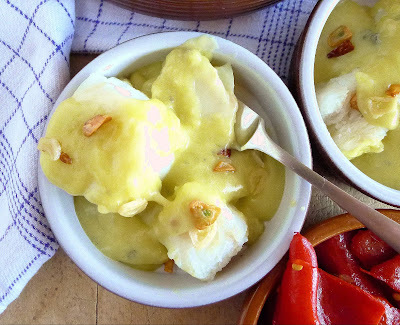 With Semana Santa (Holy Week) about to begin (tomorrow is Domingo de Ramos—Palm Sunday), I am looking through my files of bacalao recipes. 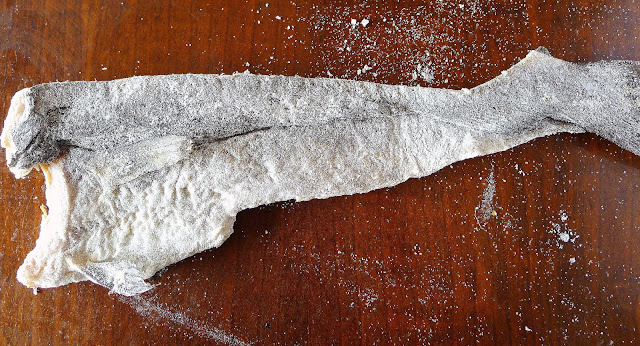 Bacalao—dry salt cod—is the most emblematic food for Holy Week everywhere in Spain. That’s because, in bygone times, they were days of abstinence, when meat was disavowed by the religiously observant. Where I live, within view of Mediterranean fishing ports, I get superb fresh fish and shellfish, so have no reason to resort to salt cod. But, for tradition’s sake, once a year it is my—no, not penance!—challenge to try out a different way of preparing it. So, bacalao is coming round again. 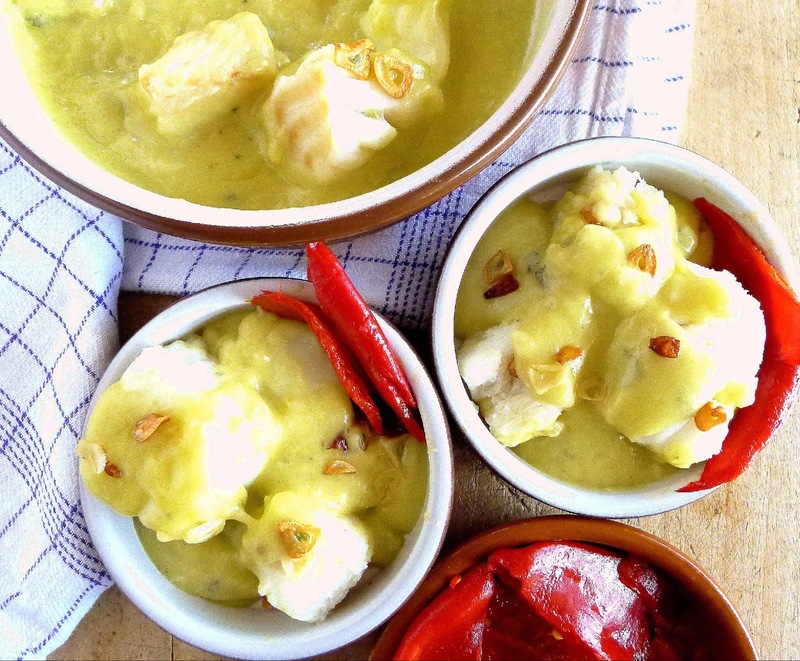 Salt cod in garlicky pil pil sauce. This year, I’m tackling a recipe loaded with mystique—the Basque preparation, bacalao al pil pil (salt cod in garlic pil pil sauce). Bacalao at a pinxto bar in Bilbao. If you’ve ever gone pinxto-hopping in Bilbao´s Old Quarter, in the neighborhood surrounding the Plaza Nueva, you may have savored this emblematic Basque dish—salt cod with a thick, golden garlic sauce. Much mystique accompanies pil pil, which consists of nothing more than cod, olive oil and garlic. First you have to convert the stiff, cardboard-like dry cod into white, flaky fish. Then you have to magically thicken the olive oil into an unctuous and delicious sauce, by slowly swirling the warmed oil into the cod. The gelatine in its skin combines with the oil to make a sauce as thick as mayonnaise. The clever Basques even invented an electric device that keeps the cazuela rocking, freeing up hands for other jobs. Supposedly the name, "pil pil," is onomatopoeic--it's the sizzle the cod makes in the hot oil. A cazuela—earthenware casserole—is perfect for cooking this dish because it holds the heat. You can use a skillet instead, but take care never to let the cod cook too hot. 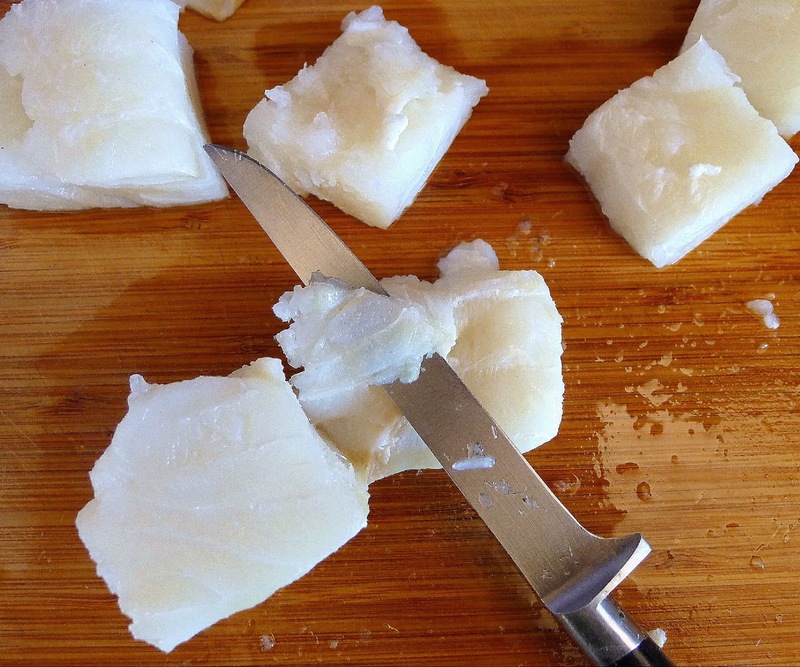 Dry salt cod must be de-salted in water before cooking. 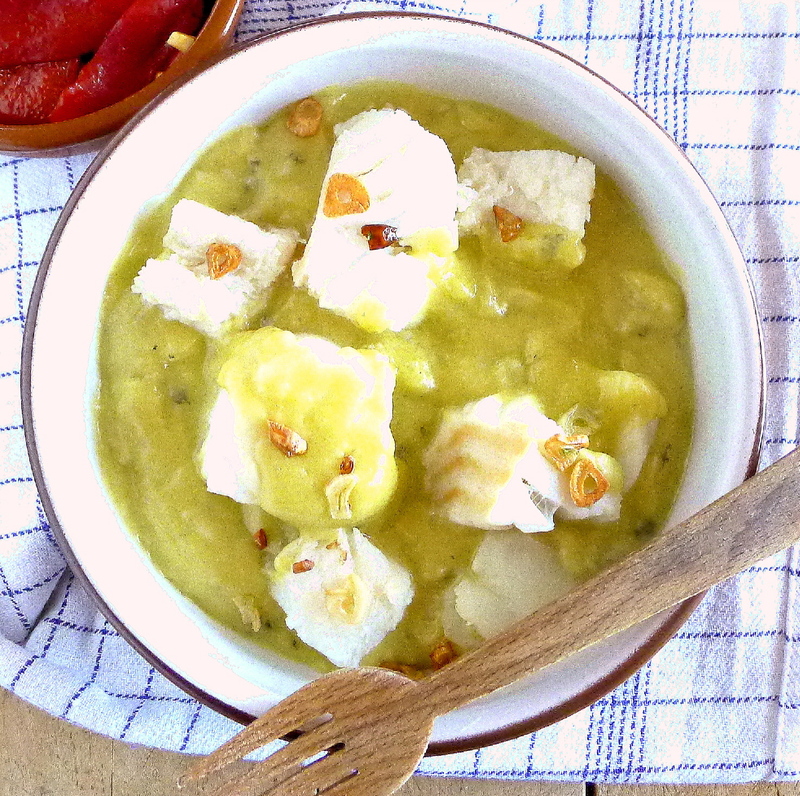 The basic recipe for bacalao al pil pil is below. But I made some variations. I used a whole split—half a cod with skin—weighing about 1 pound (that is quite small) to make the pil pil sauce. Separately, I poached 12 ounces of skinless, center-cut lomo, loin, and added it to the sauce at the end. The thick loin made 4 tapa or starter servings. The cooked cod that I used for the sauce was picked off the bones and saved to make bacalao fritters later in the week. Any leftover sauce is delicious with cooked vegetables. I like bacalao al pil pil in small portions as a tapa or starter. 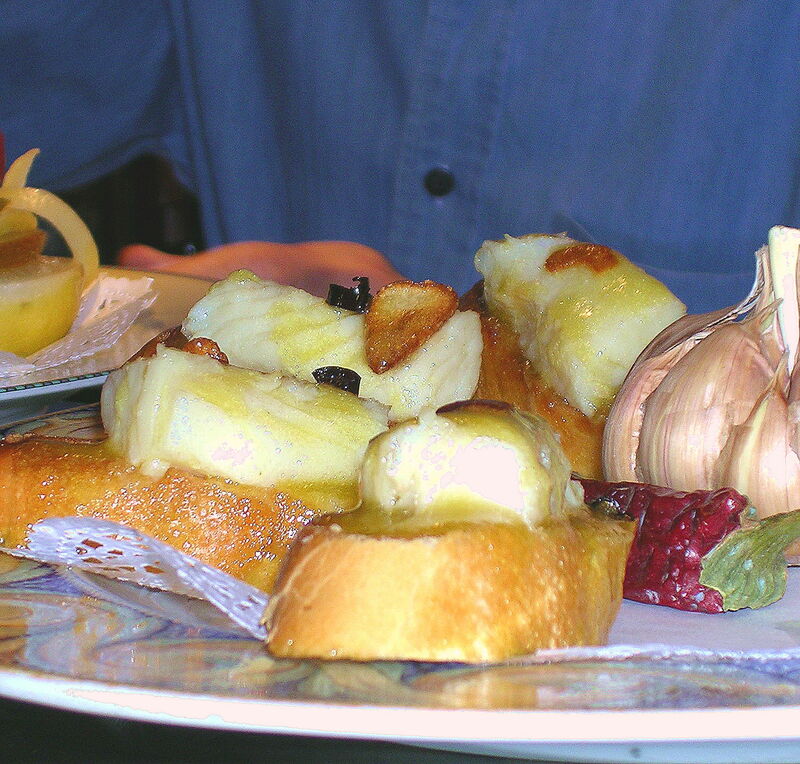 In Bilbao it is served atop bread as a pintxo (a tapa stuck on a pick). Txacolí—a bright, acidic white wine with a light fizz from Vizcaya (Basque Country)—is the perfect accompaniment. Tapa-size portions of cod pil pil, with piquillo peppers on the side. Pil pil sauce is as thick as mayonnaise. The gelatine in the cod skin causes the oil to emulsify. Makes 6 tapas or starters. De-salt the cod. Wash the cod, place it in a nonreactive bowl and cover with water. Cover the bowl and refrigerate. Soak the cod 36 to 48 hours, changing the water three times a day. After soaking. At the top are pieces with skin. Below are chunks of the skinless "loin" to be poached. Drain the cod and gently squeeze out excess water. Use fingers to find any bones in the pieces of cod. Use a filleting knife to remove them. Gently scrape off scales, but leave the skin intact. Discard any thin-fleshed and bony sections. Cut the pieces into equal-sized pieces. Pat them dry on paper towels. Heat the oil in a skillet. Add the sliced garlic and chiles and fry until garlic is just golden, 30 seconds. Skim out the garlic and chiles and reserve them. Carefully pour the oil in the pan into a heat-proof measuring cup. Cod is pilpeando--making a sizzling sound--in the oil. Heat ¼ cup of the oil in a 10-inch cazuela (earthenware casserole) or pan. Place the pieces of cod in the oil, skin side down and cook 2 minutes, shaking the cazuela so the skin doesn't stick. Very carefully turn the pieces of cod, skin side up. Add 2 tablespoons of the warm oil. 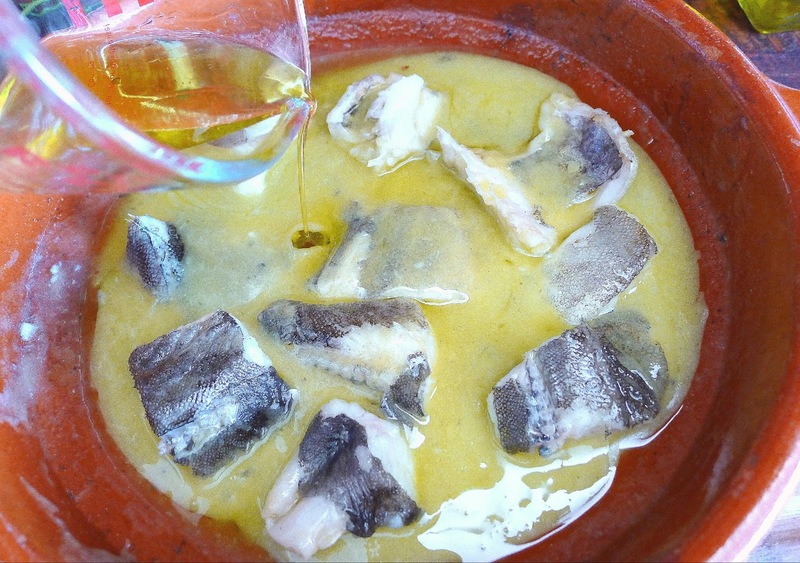 Place the cazuela over a very low heat or on top of a board or counter top and gently rock the cazuela to swirl the oil and cod in a circular motion. When the oil begins to thicken, add 1 tablespoon more warm oil. Swirl the cazuela until the oil emulsifies, then add another spoonful of oil. Swirl the oil into the cazuela. It begins to emulsify. Continue adding oil, a spoonful at a time, rocking and swirling the cazuela, until all the oil is incorporated and sauce is as thick as mayonnaise. Be patient—this will take about 15 minutes. 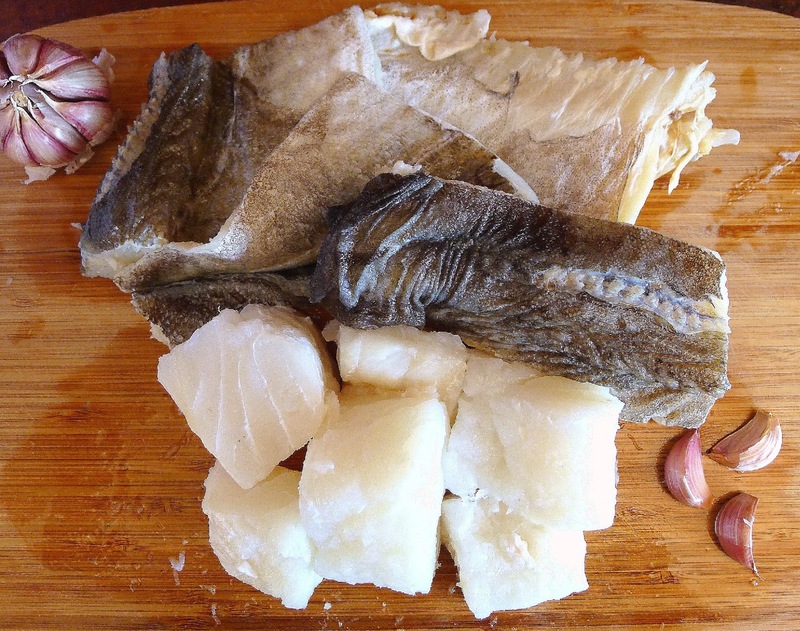 To separately poach the skinless pieces of cod, bring a pan of water to a boil. Reduce the heat to a simmer. Add the pieces of cod and poach them gently for 5 minutes. Carefully remove the cod with a slotted spoon and keep warm. Do not let the water boil or bubble. Add the poached cod to the finished pil pil sauce. Sprinkle the reserved garlic and chile on top of the cod. Serve the cod and sauce immediately or hold at room temperature for up to 30 minutes. 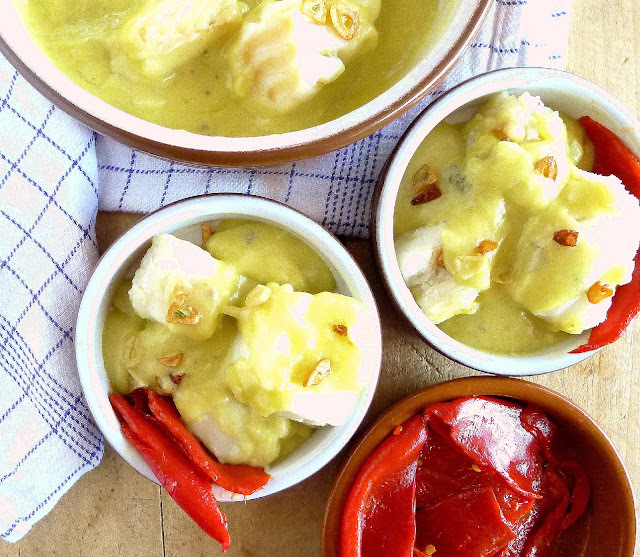 To reheat the cod and sauce, place the cazuela in a cold oven and set the temperature for 300ºF. When oven comes up to temperature, remove the cazuela, swirl in 1 tablespoon water and return to the oven for 5 minutes. Do not overheat or the sauce will separate. Individual portions of cod and sauce can be reheated in a microwave set at medium for 1 ½ minutes. I've never had much luck with bacalao, but I'll try this. I think my problem is not changing the water often enough. Shimyl: Glad you like it. Brilliant to make the sauce and then poach the lomo separately! And the reheating tip is fantastic. This is a tricky dish and now it's so much more approachable. Thanks! Donna: So pleased that you approve of my pil pil modifications. It is sooo good, but so rich I can eat it in very small servings. Thus, need to reheat. 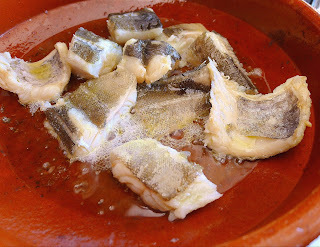 Also, in spite of soaking to remove salt, bacalao is not recommended for those with high blood pressure! I love fish, but I always have problems with cooking fish. Thank you for detailed tips. I hope it will be my next successful try.